Sports and history with Camille - Béziers Méditerranée Greeters, un autre tourisme ! 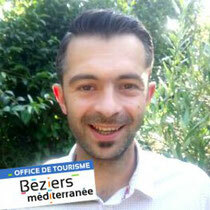 This young sportsman will show you to the local heritage in Béziers, walking or running ! He will share with you his knowledge about local History, especially the local wine producing history and its heritage. Camille is passionate about Béziers, and will make you love the city and its surroundings.